In 1770, Captain James Cook discovered Australia, and 226 years ago today, on the 26th of January 1788, Captain Arthur Phillip commanded the First Fleet as it sailed into Botany Bay (in Sydney, New South Wales). It was the first European settlement on Australian soil, and and they came to a land that had been inhabited by the the Aboriginal people for thousands of years, a land that was vastly different from the mother England they had left to venture to a new world. The Australia of today could not have been imagined by the British government as they planned a new penal colony in a land far, far away. Whatever their vision may have been, I love my country, for the life I get to live here and for what it has grown into over 200+ years. During the 31 Days writing challenge, Anne over at Modern Mrs Darcy wrote about one of my favourite Australia movies ever in her cult classics series, and some of the comments in response to the post got me thinking about the peculiarities and eccentricites of this country. As Aussies, we often have to explain nuances of Australian culture and ‘Australian-isms’ to those who haven’t lived here for any length of time. So for the last few months, I’ve been thinking about introducing a series about all things Australian – history, culture, facts and figures, and everything celebrating the unique lot that we are. Australia Day seems the perfect time to start, so here we are! We’ll kick off with some facts and figures about this Great Southland, and I’ll be asking you all for what you’d like to know more about. – Australia is an island continent, the only country in the world that is its’ own continent, with a surface area of 7,692,024 sq. kms. – Australia is a nation made up of 6 states – South Australia, New South Wales, Victoria, Queensland, Tasmania and Western Australia – and 2 territories, the Australian Capital Territory and the Northern Territory. 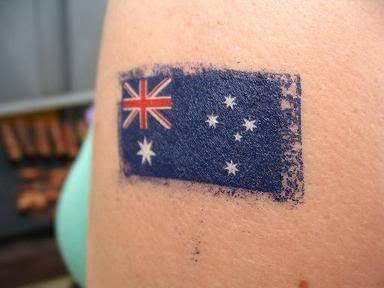 After originally being 6 independent British colonies, Australia became an independent nation on January 1, 1901. – The capital of Australia is Canberra (ACT). – As of today, the population of Australia is approximately 23,364,300, and the main language is English. – Approximately 80% of the population live along the coastline of the country, within 100km of the coast. – Australia is a constitutional monarchy, which means we have a head of state in Queen Elizabeth II, who is represented in Australia by the Governor-General. – Our head of government is Tony Abbott, the Prime Minister. – Our currency is the Australian dollar, and we use the metric system (which includes measurement, weight and temperature). – We have a universal health care system, that provides free hospital care and subsidised primary care. – The average life expectancy is 79.5 years for men, and 84 for women. Short and sweet for now, but it gives you a snapshot of the land where I live, this amazing, beautiful, breathtaking, quirky country with a history of triumph, heartbreak, progress and tragedy. So tell me, what do you want to know about Australia? History? Stories? Sport, art, culture? Come and chat in the comments, and I’ll do my best to help! I’ll leave you with an iconic song that sings the story of how we came to be. Whether we born here from a long line of generations, or arrived on our shores seeking a new life, we are all part of this place called Australia.